Running a World of Warcraft guild can be a thankless job. As any manager of people can attest, you have a wide variety of personalities all thrown together. And while we don't have a product to offer, as would be the case of a work place, we have goals. Achieving said goals means working together and that can be tough when Brenda is having a panic attack, Rob's girlfriend dumped him, Mona's dog is throwing up all over the living room carpet, and Derrick's mother is yelling at him to take out the garbage and help her move a table. You become confidante, counselor, and crisis manager. Still, I wouldn't disband my guild for anything because, in spite of all of this, many of us are, deep down, friends. We've bonded over pixels on a computer screen and have extended that bond into our real lives. There are some people I don't know very well. They are names on the screen; avatars in a group; there, but not extraordinarily present. I don't know their lives. They come on, do their thing, and log off. They are happy to be in a guild with lower pressure to play. I never know if they are happy or just don't want the hassle of trying to find another guild. And then I get asked for my name and address because, "I have something to send to you." Ordinarily, my real self isn't available to people I don't know. But guild members who have hung around for at least 8 months, even if they rarely talk in chat, can "break that 4th wall", if you will. So, I gave Kacy my name and address. I really didn't have a gut feeling she would abuse it. Last month, I got a slim, small, packet in the mail. 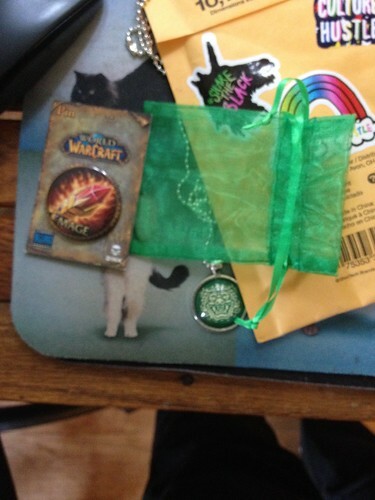 There was a pin depicting mages, one of the classes you can play, and a green mesh bag with something inside it. 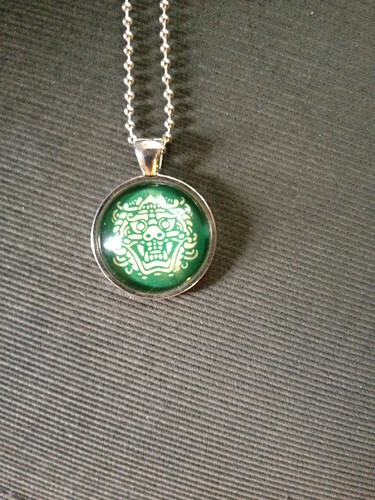 It's a silver necklace with the guild icon in it. I was, and still am, blown away by this kindness. I'm not one for jewelry anymore, but I will wear this every day during the guild's trip to Disney World in October. People surprise me in very meaningful ways. All I need to do, when I'm feeling oppressed about dealing with people, is to look at this and remember, everyone has bad days and how I lead is important. I guess I'm doing something right.